Why a Woman Will Offer More for Your Property and How to Hook Her! Women are three times as likely to pay the asking price for a property as men – at least according to Propertyfinder.com – does this mean that all sellers should be targeting the women in the hope of getting the best price? As a consequence, he will often keep looking until he finds exactly what it is he’s looking for on his checklist, viewing as many properties as is necessary until he finds the right one. In contrast, the average British female does her homework first, and relies far more on her gut instinct. She’s generally more interested in the ‘feel’ of a place, and trusts that she’ll know the right house when she steps inside, regardless of how many ticks it gets on the checklist. In addition, the way in which men and women offer on property differs strongly; men often see the art of negotiation as a fight, and they’re up for it. Wielding their offer like a sword, they’re brutal and determined not to give an inch. Statistics show that only 5.5% of men pay the full asking price, and 22% offer less than 90% of the asking price. Women buyers, on the other hand, are much softer and 17% of them just offer the full asking price of the property they want. 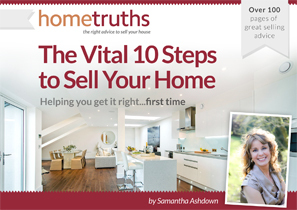 90% of female buyers offer 10% or less below the asking price, seemingly anxious not to lose their chosen property. With this in mind then, how can you make your property more appealing to that lucrative female market? Well, start off by making sure it looks and smells clean and fresh. Women are much more sensitive than men to nasty smells, so make sure your house doesn’t pong! Clean clean and clean some more, until every nook and cranny of your house is gleaming: she’ll notice. Appeal to her feminine side with flowers and bowls of fresh fruit. A man wouldn’t be seduced by such blatant ploys but a woman will. In the bedroom, keep bedding absolutely fresh, and if possible, new. In the bathroom, appeal to her sense of luxury with lovely fluffy towels, scented candles and special toiletries. If she loves your house when she walks through the door, you’ve hooked her. And if she offers too low for you, hold out for the best price, chances are you’ll get it.